This quarter we’re taking another look at the lymph node, but this time it’s one that contains the pathology of a nodular sclerosing Hodgkin lymphoma. As the B-cells multiply, this process is displayed by the appearance of these roughly circular “follicles”. The paler central zones are known as germinal centers. For a more detailed description of why and how these follicles form, please see a previous HistoQuarterly edition on the lymph node. A lymphoma is a cancer that arises from lymph glands or organs within our lymphatic system, such as the lymph nodes and bone marrow. Lymphoma itself describes a wide range of cancers from this system, but all of them can be classified into two main groups; Hodgkin Lymphoma and Non-Hodgkin Lymphoma. How they are classified depends on the presence of one type of cell called the Reed-Sternberg cell, which is only found in Hodgkin Lymphoma. These owlface-shaped (you’ll see soon) cells are thought to have been antibody-producing cells (a type of B-cell called a plasma cell) that have now become malignant. 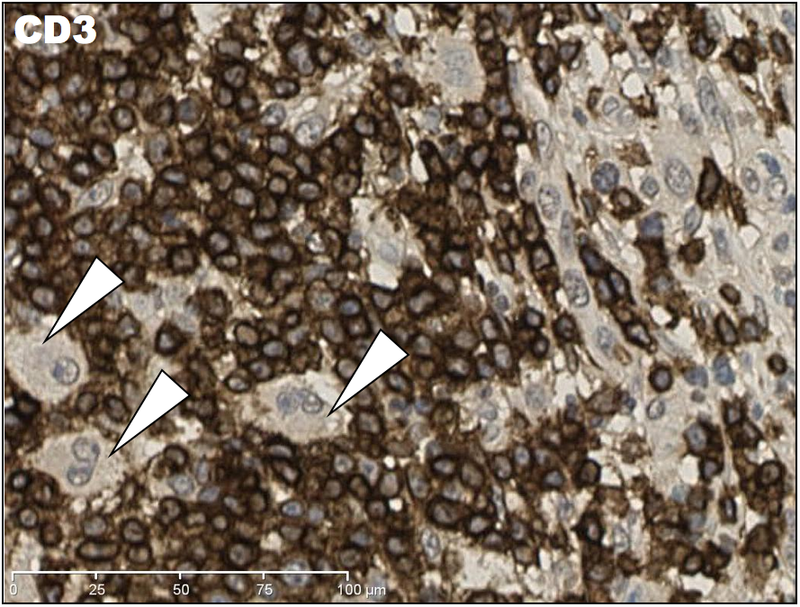 This blogpost focuses on the histopathology of the nodular sclerosing subtype of Hodgkin Lymphoma (HL). 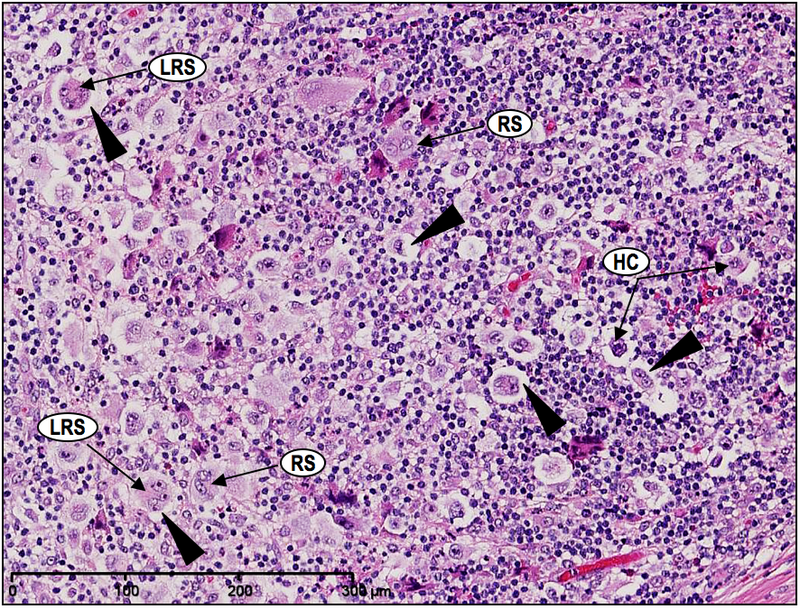 Altogether, there a four main classic types of HL, but nodular sclerosing is the most common in developed countries, accounting for approximately 60% of patients diagnosed with HL. 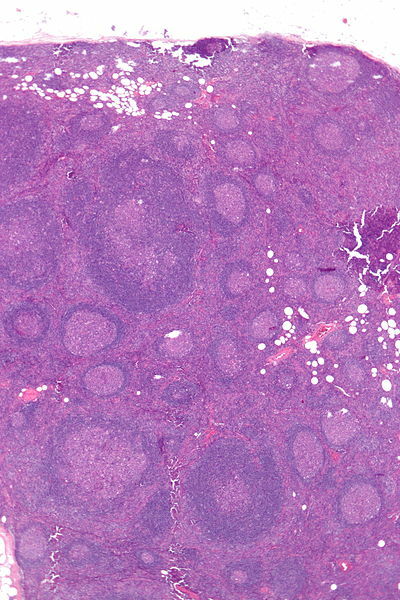 A low magnification H&E showing dense bands of collagen causing effacement of lymph node architecture, and formation of distinct nodules. Comparing this lymph node with the reactive lymph node, you can see the distinct difference between the appearance of follicles and nodules due to the dense collagen (pink) in between the latter. 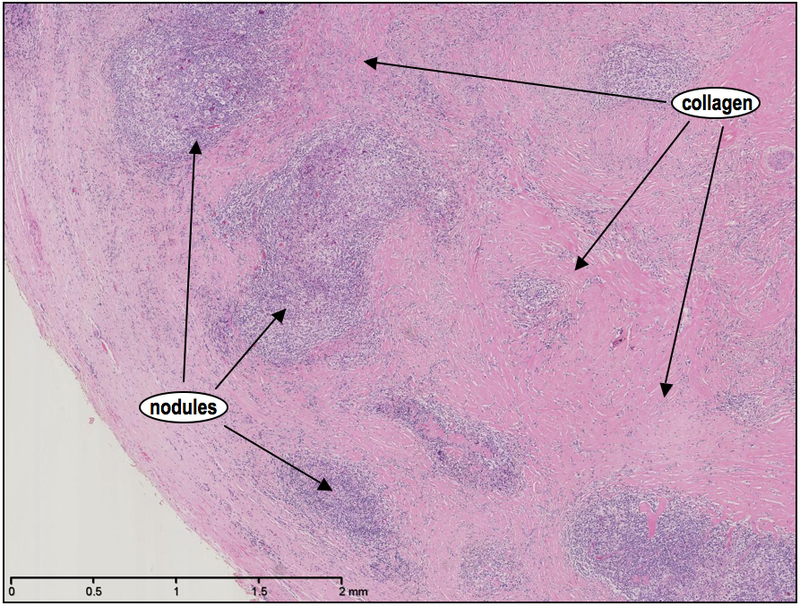 It’s this accumulation of collagen and the resulting formation of these nodules that earn this type of lymphoma its “nodular sclerosing” title. “Sclerosis” is a word often used to describe an overgrowth of fibrous, connective tissue. High magnification H&E showing dense collagen bands and the mixture of cells within the nodules. 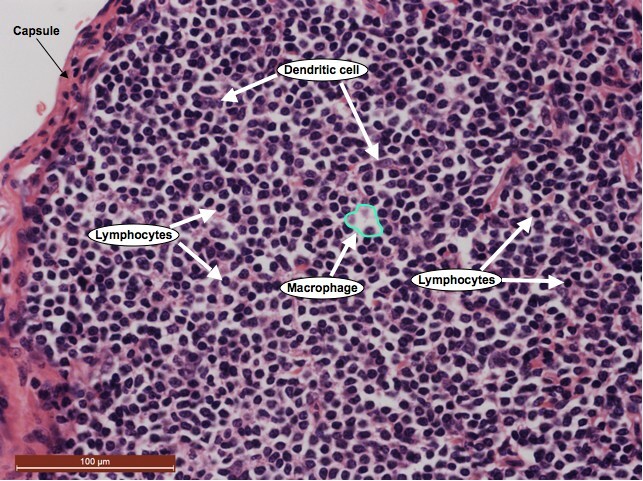 What can also be seen in the above image is the mixture of different cell types within the nodule; small lymphocytes (small, dark staining rounded cells), plasma cells (eccentric nucleus), eosinophils (dark pink cells) and pale histiocytes (vary in appearance). At this stage of the diagnosis, the pathologist would know that such an increased mixture of cells, particularly eosinophils, is a significant characteristic of both T-cell and Hodgkin lymphomas. 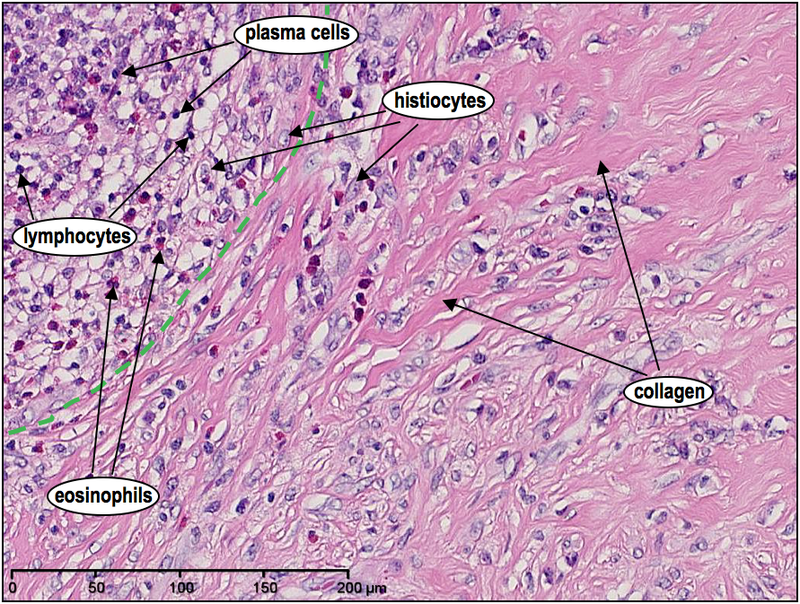 [To see normal lymph node cell mixtures, see here]. Medium magnification H&E of the nodule demonstrating irregular large cells such as the mononuclear Hodgkin Cells (HC); the binucleated owl-face Reed-Sternberg (RS) cell, and the lacunar Reed-Sternberg (LRS) cells with single hyperlobulated nucleus and lacunae, or halo, caused by the retraction of its cytoplasm (arrowhead). High magnification H&E demonstrating more clearly the binucleated owl-face (see!) 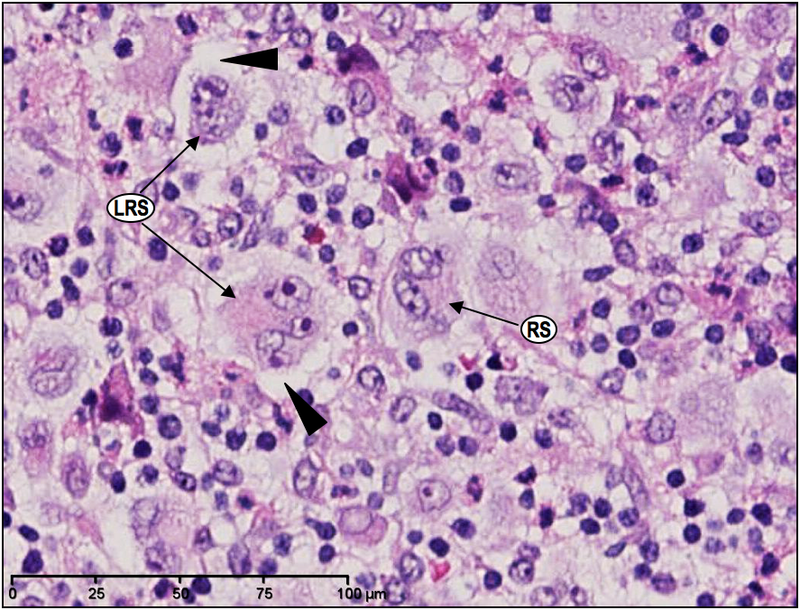 Reed-Sternberg (RS) cells and lacunar Reed-Sternberg (LRS) cells with their lacunae (arrowhead). These H&E images are enough to convince us that what we’re looking at are in fact those Reed-Sternberg cells, and thus a type of Hodgkin Lymphoma. 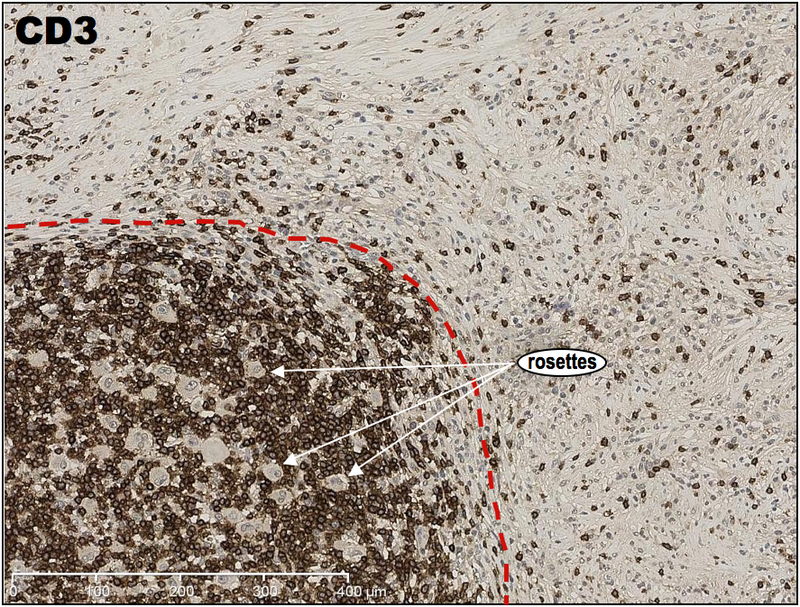 But, a pathologist will also use immunohistochemistry (IHC) to determine the cell lineage of the tumour and these large irregular cells in order to confirm the full diagnosis. In brief, IHC uses solutions containing antibodies that bind to specific antigens/markers. The solution is poured onto the tissue section to allow the antibodies to bind to the antigen of interest (if present). These antibodies also bind to a chromogen (colour signal) that stains brown when the antigen/marker is present. 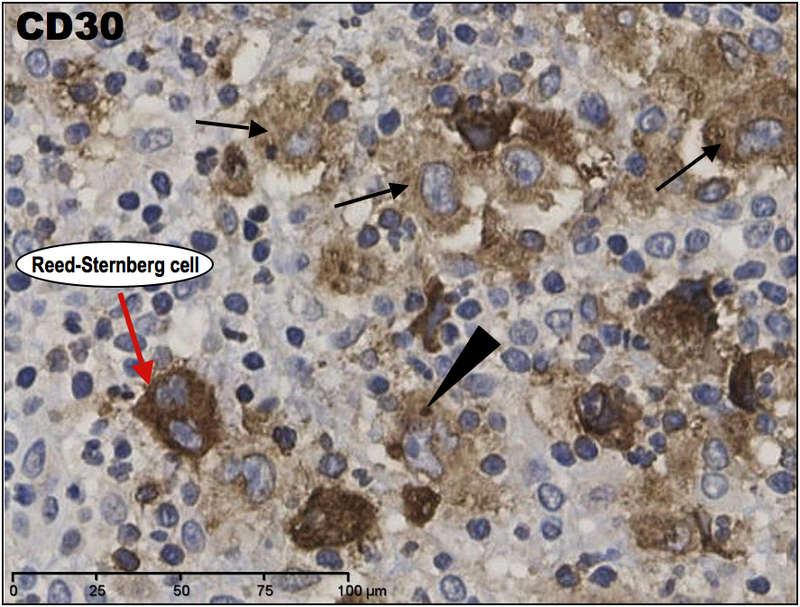 In this particular case study, the pathologist used five different IHC antibodies to highlight different cell lineages, and these were CD3 (CD stands for “cluster of differentiation”), CD20, CD45, CD30 and CD15. Low magnification of IHC CD3. The boundary of the nodule is marked with red outline. There is a dense T-cell population within the nodules, and they are also forming “rosettes” around the CD3-negative large cells. From this, we can now confirm that the large cells are not of T-cell lineage. Low magnification IHC CD20 demonstrating cells of B-cell lineage, which seem sparse and confined to the periphery of the nodule only. 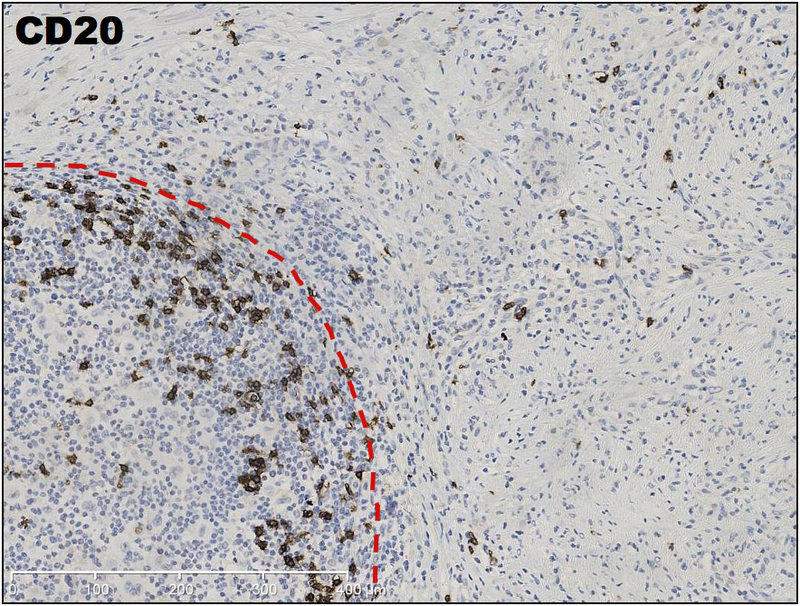 High magnification IHC CD20 demonstrating CD20-negative large irregular cells (arrowheads). 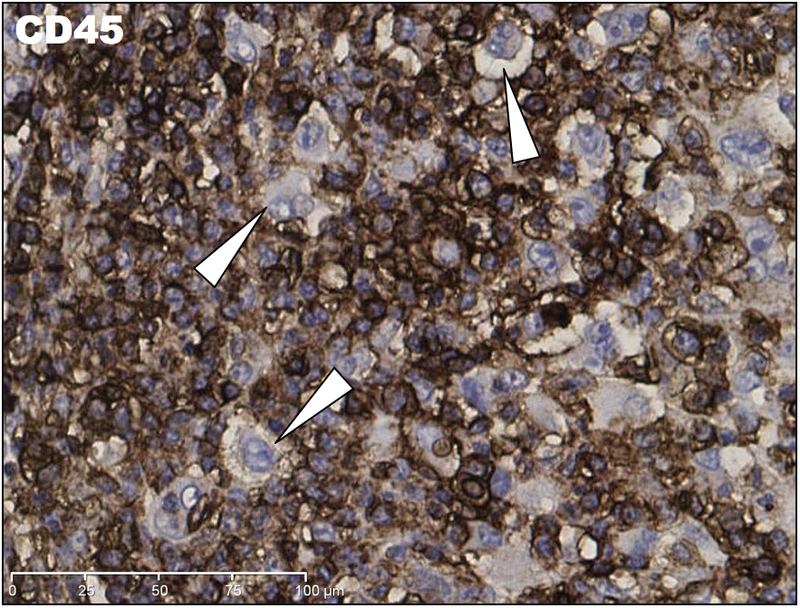 Medium magnification IHC CD45 demonstrating a not-surprising dense population of CD45 positive cells. 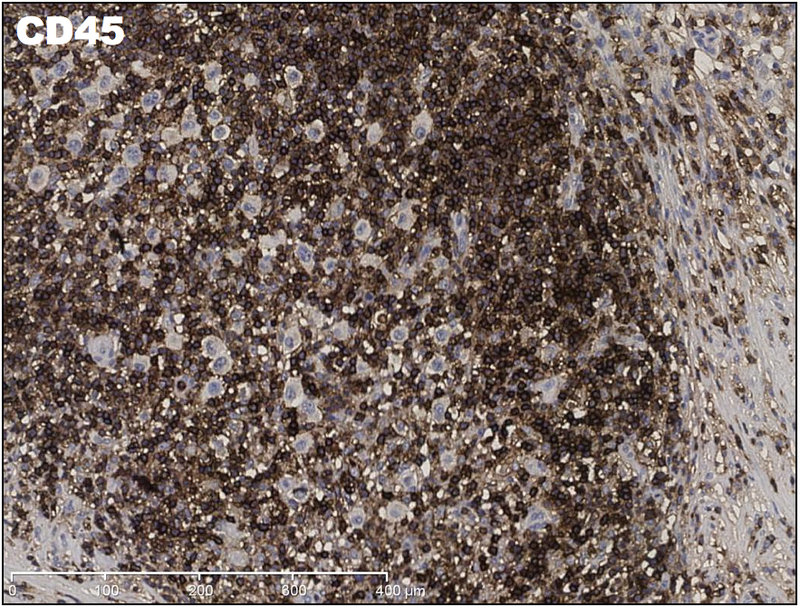 High magnification IHC CD45, however, confirms the large irregular cells are CD45-negative also. 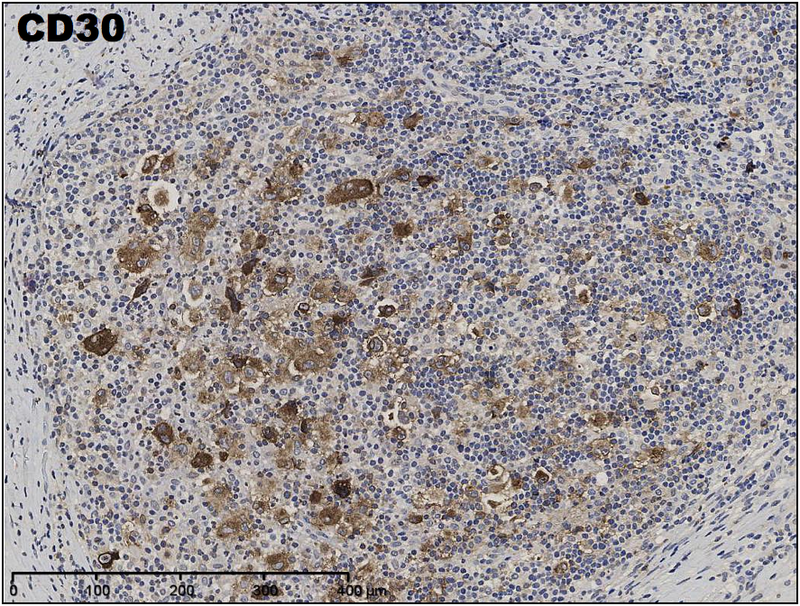 These IHC results are fairly inconclusive when used independently without further IHC tests because they are just used to determine a generic picture of cell lineages involved in the pathology rather than to confirm a specific diagnosis. Medium magnification IHC CD30 demonstrating large cell positivity. 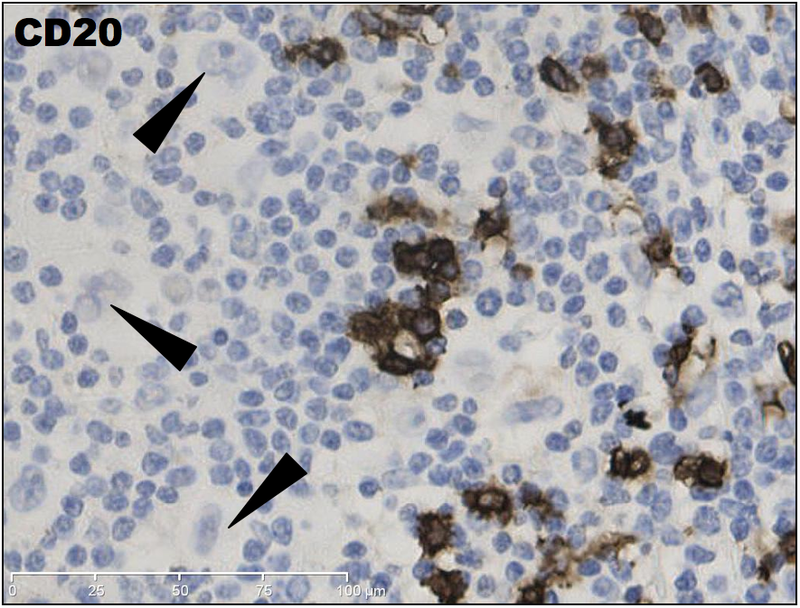 High power IHC CD30 demonstrates positivity in the Reed-Sternberg cells and mononuclear Hodgkin cells (arrows). 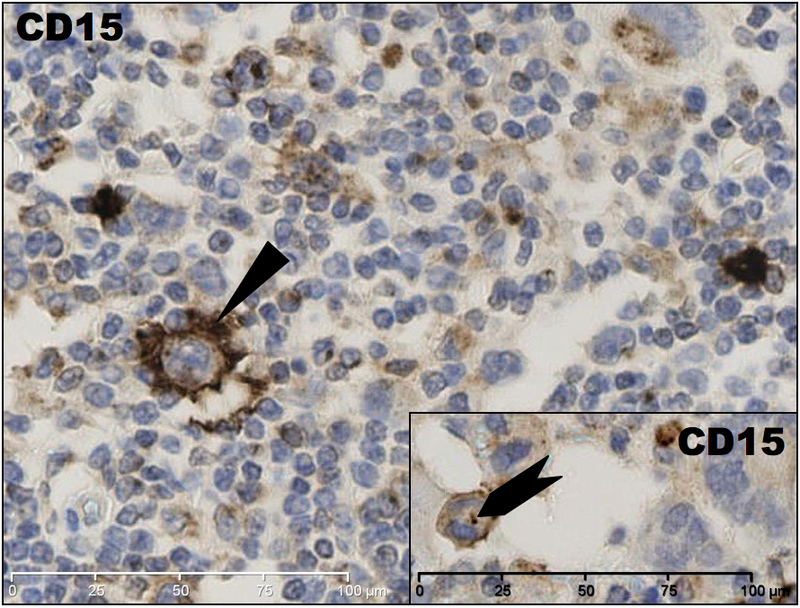 CD30 has a characteristic staining pattern in large-cell membranes, and the Golgi apparatus – the dark paranuclear dot (arrowhead). High magnification IHC CD15 demonstrating the cell membrane positivity in the large cells, and the dark dot-staining of the paranuclear Golgi apparatus. With the histological appearances and the outcome of the IHC panel, this can now be confirmed as classical Hodgkin lymphoma, nodular sclerosing subtype. Cancer research had advanced so considerably in this field that it is common now for the majority of patients treated for Hodgkin Lymphoma to become completely cured. This does, however, depend on the stage of the HL at diagnosis. Bone marrow trephines are painful and sometimes a stressful procedure, but Moulin-Romsee et al., 2010 have found a promising possibility of combining positron emission tomography (PET) and computed tomography (CT) scans, which may render the trephine biopsy obsolete after finding a significant correlation of results between the two methods. Focus on Lymphoma app, designed to provide reliable information about the patient’s lymphoma, and how to manage their treatment. Lymphoma Hub – the latest news and information in lymphoma and CLL. « Make your own gallbladder. Of course. Thank you very much, Alan. I’m really pleased you’ve found my blogpost useful.